Well, now… it’s not every day that a fellow gets a statue of Horus dropped on his head. Love the lo! 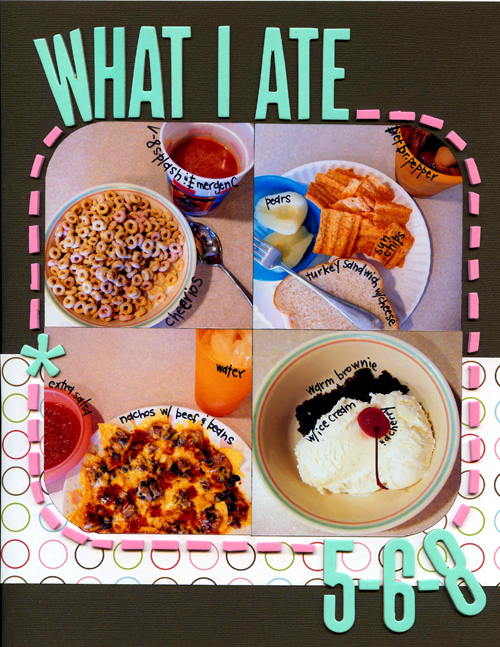 I like how your journaling swirls around the food. I wish, though, that I could have a bite of the brownie and ice cream! The boys… how funny. And just where did they get an egytian god statue?! Is Avery okay? I didn’t even notice the lack of veggies. tell vivian you hide broccoli in the brownies. : grin : at the horse bruise. I have notebooks filled with crazy kid statements. yesterday he said, “I’m the smallest boy in my class.” … pause … “did you take clarinex before I was born?” (no idea what clarinex is.) I said, “you’re exactly perfectly sized. you just happen to have 3 boys (in his class of 8) who are taller than average.” and I told him about the chart at the doctor’s office and how he’s always been right on the black line at every check-up. and I denied ever using “clarinex”.